Kaveri Trail Marathon, it is supposedly the toughest marathon in our country, that tag line draws a lot of crowd to this race and without denial, it is a tough race. What makes it tough is it’s localized weather due to the irrigation canal running all along the course. The seemingly harmless water stays that way through the day, cutting across the fields of green, splitting into smaller streams, irrigating the fields and then rejoining the main canal. The water also brings along humidity and humidity is what makes KTM a crazy trail to run on especially if the sun decides to be a little evil. The sun; Bangalore keeps the fireball out of sight for a good part of the year, while it is rosy to run on mist covered trails and in slight endless drizzle in places like the Decathlon trail and the peacock reserve, it really isn’t a rosy feeling when the sun is out of the clouds and singes your skin to remind you that there’s a devil to it too, it’s the devil you have never met and on the mock run I met it very ill prepared. Calling the mock run evil and ugly wouldn’t make it mud slinging, it would just be two words forming a preamble to the suffering it dished out. Two weeks prior to the race, a thirty kilometer run with a delayed start saw the sun out of the horizon, bright and smoldering, warming the waters, churning the humidity and beating down hard. Plus you could see Santhosh smiling, that is a very bad combination. Kilometer twenty five into the mock run, it was turn around time and I was already gutted, I was finding it hard to move and two weeks later I found myself in the same exact situation, just that the sun was milder and the distance larger. The first twenty one kilometers had been run with precision, a tad slower, but well within three hours, just according to my race plan. As I turned around to start the last loop, Rashmi and Asha handed out a nice juicy sandwich, it was delicious and filling. Rashmi, Asha, Pani and Pani’s daughter, had made the four hundred meter mark their little domain, a pocket of energy and they cheered every runner, RH runner or not, they cheered them onward, it felt comforting and good to have some company, the three of them would continue to stay put for the next four hours when I finally finished the race, just cannot be thankful enough. I was positive about the run so far and kept moving till marker twenty five, after which I went head-on into my wall, my energy and strength disappeared and I slowed to a walk, a small shuffle and a walk again and it didn’t seem to help.The culvert stop happened first, I first sat and then laid down, it was short and much needed. Saw the birds, saw a few runners move ahead, caught my breath and decided it was time to move. The culvert stop was good, a little snooze button, that small break brought back the strength and I was happy to trudge and then amble away. I dunked my head with ice cold water from a sponge at the aid station and played with a few puppies and kept running as much as possible, after moving steady for a little while my body suddenly started craving that break again. It was overwhelming, I gave in and this time I just stepped off the trail and laid down on the grass on my back, this run was turning out to be increasingly tougher but I knew this was my lazy bum tripping me, and with Paroma beginning to look anxious I coaxed myself to get up and keep moving. I reached the only uphill section on the trail just after the thirty km mark and walked it, by this time, the runners had thinned out and at the turn around the volunteers were glad to see the last of us, I sat on a chair and yet again dunked my head in ice cold water, grabbed a banana, stuffed it in my mouth and yet again tried to run. And then the half squats started, just bend over, place your elbows on your knees, push your precious hind a little and look at the ground intently. Sometimes the water and sweat trickles onto the ground and sometimes you find it nice to see that little beetle scurry away from the monstrous creature that you are, then a few minutes later you regain your senses, stand tall and try putting each foot forward and gain some momentum. Another kilometer of effort and I hear Santhosh calling out, what a relief to have company, me and Paroma gain some momentum downhill and see Sushmitha and Neel with their car, we know the car is not for us, would I have taken a ride back if Santhosh wasn’t around? Nope. That I’m sure off. I was in a dogged frame mind of time ever since I signed up for the marathon, what come may, there would be no quitting. Ya, I would have snuggled and slept if not dragged out in time by the chief. We ate some yummy curd rice that Sushmitha carried, ate a chocolate and started to move again. Santhosh leading the pack, Paroma in the middle, me the rear guard, doing an unofficial sweep for RFL, looking for any lost runner and lost belongings. This was the last nine kilometers, the longest ever. I took two hours to cover the last ten kilometers. No, measuring the distance in time and some other metric will never do justice to those last nine. The whole nine yards. I gave Santhosh and Paroma a hard time, I was coaxed, I was requested, threatened, chided and finally pushed to run those last nine kilometers. We ran from shadow to shadow, which was scarce, resting and walking in the shade of the trees. I’d bend over for three counts and not move, till Santhosh caught me cheating. I suppose he hit with a small stick as well, but I was too conked to remember clearly. The aid stations waited for the trio of us to pass them and wrap up and overtake us in their vehicle to wait for us at the next aid station. The guys in the vehicle had this puzzled look, they had spent two days on the course and seen a thousand runners and yet they couldn’t figure out what the whole lot of us were up to, and what we really gained by this paid torture, some of them smiled wryly and looked away when I caught them staring and flashed a big smile and waved at them. We ran from kilometer to kilometer and after a very long long time, the last kilometer came up, then the last five hundred meters, Santhosh pushed me hard. literally, he placed both his hands on my back, like jump starting a car and handed me over to Mani, and Mani accompanied me to the finish. At the finish, there was no tape to run abreast, no champagne and no fireworks. There was one half of the timing mat, to record two last runners and a truck backing up. But what awaited me at the finish was a gang of friends who have rallied behind, who have supported and cheered without disdain and without expecting a thing in return. I ran to the finish, the trail lined with Asha, Rashmi, Pani, Abhineet, Chandra and Asad cheering me on, I picked a little pace and strode to the finish, ran to the mat and stopped, didn’t cross over and waited for Paroma to join me, we crossed over together. Wouldn’t make sense to finish alone when we had trained together all season and run the whole race together but the last few hundred meters. I sipped on some tender coconut that Rashmi gave me, I went to the culvert near the pool and sat down. 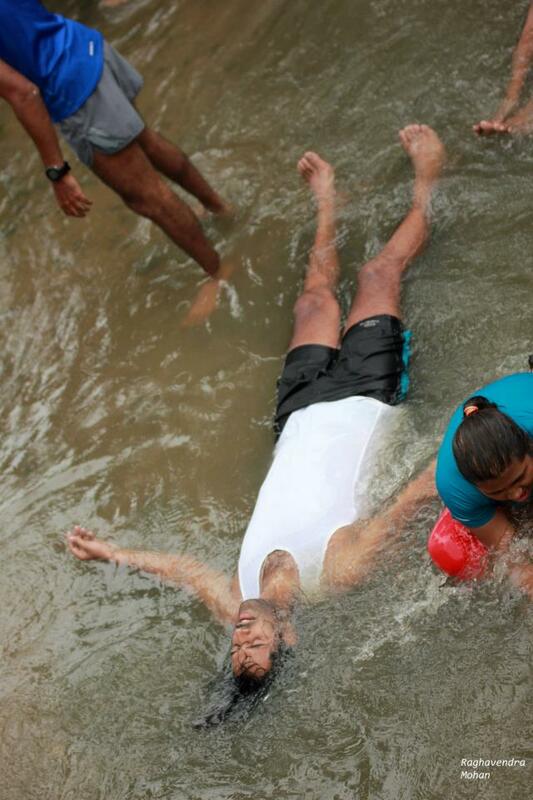 Srini P was there, taking a dip and Karthik too. Karthik looked at me and asked me how was the experience. I remember just looking at him with no words to answer that, I just looked at him, blank, expressionless Karthik smiled and told me to tell him later. It all started sometime in February, 2013, in airlines hotel. Sipping our favorite coffee, Kaiwan and Srini P, told me that I was ready for the full. Ready to attempt it atleast. It was a surreal moment, when two real “crazy” strong runners tell you that you are equipped to take on a full, you feel good and when the chief mentions nothing that sounds like a nay, you start pounding your fists and then calm down to access what you are getting into. The training was phenomenal, everybody, Srini P, Srini V, Asad, Vinay, Sourav, Sindhu, Meghana, Chandra, Susan, the Chief, Ajay, Kaiwan, George, Kanishka have shown the trust and belief that I could finish it and never once doubted it. The marathoners buddy group of Mani, Karthik, Sharath, Kavitha [I travelled with Kavitha to the race location and back, what a blast we had :D], Anindo, Naveen, Martin was a crazy gang, and all of them fast, I’m gonna smuggle a pair of roller skates to play catch up. I trained hard this season and didn’t miss a single long run, bounced back from a pretty severe injury that scared the wits out of me and Paroma gave me the support and put up with a whole lot of tantrums to do it. Then there’s Siva, Jayanti, Bipra, Asha, Malay and yes the whole of RH. Would never have been possible without these guys. Coming back to the run, every KTM run ends in the pool. I slowly laid down in the ice cold water, the chill spreading through my spine, I gasped and strangely I felt hollow, I always thought there would be a keen sense of accomplishment when I ran my full, to make my chest swell, but there wasn’t. There was definitely a sense of satisfaction, to have completed what I started off with. I lowered myself a little further, till my ears were below water, the voices muffled out, the gush of the water silenced, my legs and torso raised themselves buoyed by the water and the silence was stunning. 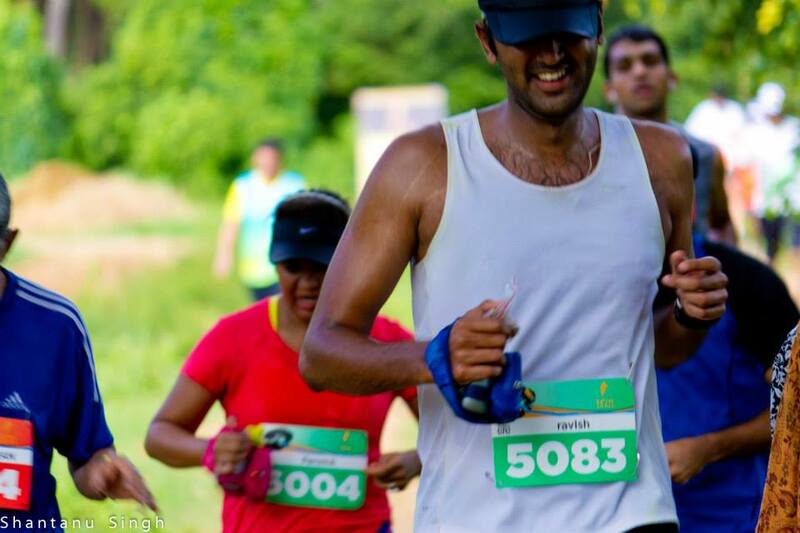 This entry was tagged 26 miles, 42.2, bangalore marathon, kaveri trail marathon, KTM, Mysore, race story, ravish bhambore, RFL, runner's high, runners for life, running wall, Srirangapatna. Bookmark the permalink.